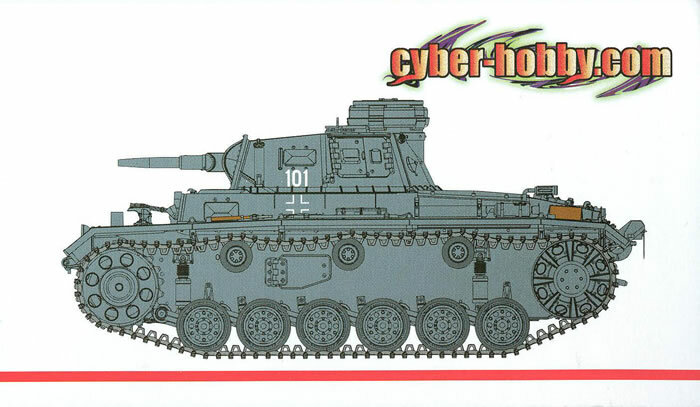 DML’s boutique subsidiary cyber-hobby.com has now released a fitting companion piece to the Ausf. F diving tank from “Operation Seeloewe” in an Ausf. G with the diving fittings but none of the sealing materials provided in the first kit (cyber-hobby No. 71, DML No. 6717). As noted in the review of the first kit, the Germans basically conceded that the tanks would sink, so their approach was to waterproof the tank and fit it with a snorkel system and pressure relief exhaust so it could operate autonomously under water. For their invasion of England that was planned for late 1940 (after the pesky RAF had been eliminated) the Germans converted 168 Pzkw. III Ausf. F and G tanks to use this system; these were dubbed “Tauchpanzer” or diving tanks. The system consisted of a number of seals to prevent water leakage into the hull and a pressure relief exhaust fitting that prevented water backflow into the engine. A floating snorkel buoy was developed that was fitted with a rubber hose that could stretch up to 15 meters in length for air intake; to avoid taking in the exhaust gases which would bubble up and also to avoid problems with a high sea state there was an extended intake tube on top of the snorkel buoy, as well as a short radio antenna for communications. For navigation purposes underwater a gyrocompass was fitted for the driver. The tanks were to be driven off a ramp from a landing ship into the water and then driven to land, where the seals would be removed so the tanks could then join in combat. But after the cancellation of “Seeloewe” at the end of September 1940 the tanks were then converted to a simpler system to provide for limited water crossing capability of only about five meters for use in the invasion of Russia. The best known use of the vehicles was on 22 June 1941 when the modified Pzkw. III tanks of the 18th Panzer Division crossed the Bug River. This kit has most of the same components from the F kit less the DS Plastic seals and hoses. It does come with the depth gauges but the kit has you build it as a “defrocked” diving tank as used in Russia during 1941 after crossing the Bug River. As with all DML Panzer III kits the suspension begins with five of the original seven “mini-sprues” and three new ones provided for the early model “porthole” drivers and more complex idlers, plus newly molded shock absorbers. The hull pan is one with the side hatches and other detail changes. It retains the full torsion bar suspension from the other kit and the detailed suspension components and muffler assembly. As with the earlier kits all hatches are separate with some interior details and can be positioned as the modeler chooses. All engine deck ventilators are spaced and mounted on separate frames to get the correct appearance and “lift” needed to give an accurate representation of the original. A completely new engine deck is provided for the early variants of the Pzkw. III with this kit. The kit includes the rudiments of an interior, but unlike many Russian or Ukrainian kits the details they provide are highly accurate as far as they go. This should please the “after market boys” as there is more than enough room for a nice resin interior here and enough ports and hatches to see it. The gun follows most of the DML standard design concepts and faithfully replicates the internal mantlet as well as the rest of the small details of this petite weapon. For the G model this kit does provide the early Pzkw. IV cupola as well as a different turret shell with the ventilator fan mount. As it comes sans seals, it also comes with three MG34 machine guns (one hull and two turret versions). The kit comes with 36 cm “Magic Track” single-links, and while not wrong many modelers appreciate the DS plastic tracks as they speed construction. Technical consultants are Tom Cockle and Gary Edmundson. As this kit covers the tank in combat, it provides for three finishing options: oddly enough, they are all from Pz.Abt. D in 1940 and not the Barbarossa ones. All three are in Panzer Grey with white markings: 101, 110Y or 11-35, all with white crosses. A tiny set of Cartograf decals are provided. Overall this is a cheaper version of the diving Panzer III which is more useful to those who want to model one in “combat” mode.